Summary of Content: Begins a dramatic love letter to his fiancee with, " I have told you, and I told you truly that I love you too much . . . I meet you in every dream. . . I am to be thus monopolized by a little nut brown maid like you and from a Statesman and soldier metamorphosed into a puny lover." Continues on to say how much he misses her, but that he must remain until Lieutenant Colonel Robert Hanson Harrison returns. States that he will not be delayed past November and assures her that he is doing everything in his power to return. Descriptively explains how much he loves and misses her, ". . . my darling Betsey, to taste the heaven that awaits me in your bosom. Is my language too strong? . . . you will only know when wrapt in each others arms we give and take those delicious caresses which love inspires and marriage sanctifies." Admonishes her for not writing enough. Asks whether she would prefer him to wear his uniform for their marriage and whether she wants to follow their plan to be married secretly. 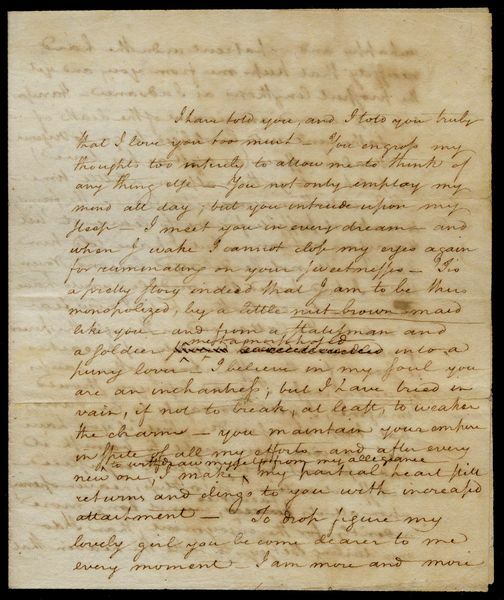 Requests that she ask Margarita Schuyler (Peggy, Elizabeth's sister) if she will serve as the main character in a writing of his entitled, "The way to get him, for the benefit of all single ladies who desire to be married." Background Information: Signer of the U.S. Constitution. Schuyler was the daughter of General Philip Schuyler and Hamilton's fiancee at the time. They married in December 1780.